Burn After Reading may be the most depressing comedy I’ve seen. I left the theater in a daze, wanting a shower. I wondered how the Coen Bros. could sleep. I wondered how they could keep from blowing their brains out with such a misanthropic view of humanity. It’s not that their characters are greedy, grasping, callous and stupid. It’s the smallness of what they’re greedy about and grasping after. Even tragedy elevates humanity because it implies a greatness from which we can fall. This thing? Smallness overwhelms. Basically: Osbourne Cox (John Malkovich) gets canned from the CIA for a minor breach and decides to write his memoirs, always pronounced with a self-important, nails-on-the-chalkboard, beautifully affected lilt, and his wife, the coldest of pediatricians (Tilda Swinton), who’s having an affair with FBI man Harry Pfarrer (George Clooney), refuses to understand, or care, and files for divorce. Through this process the unfinished memoirs winds up in the hands of a pair of gym-club idiots: Linda Litzke (Francis McDormand) and Chad Feldheimer (Brad Pitt). Linda wants cosmetic surgery to stay in the dating game, doesn’t understand why her insurance won’t pay for it, and decides to blackmail Cox to get the money. Chad? What does he want? He’s such an idiot, such a beautiful idiot, he doesn’t even have a plan like everyone else. This makes him my favorite character in the film. At least he’s not grasping after smallness. He’s just gloriously stupid. Contemplating what everyone here is grasping after can drive you to drink. Cox wants retribution against the CIA but doesn’t have the discipline to finish his book and winds up, each early afternoon, half-drunk and watching “Family Feud” on the tube. Litzke wants cosmetic surgery — a temporary salve for a not-pretty woman. Pfarrer uses an Internet dating site to sleep around on his wife with not-pretty women, then crumples when his wife, with an affair of her own, files for divorce. He’s also happily building something secret in his basement. Turns out to be a sad little pornographic machine. It’s almost a relief when people begin dying. 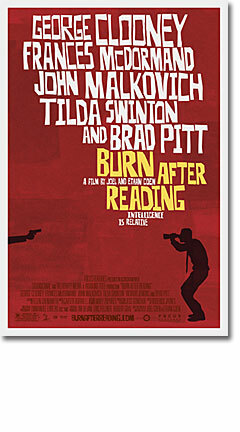 Yes, Burn After Reading is well-made. If it weren’t, it wouldn’t have had the affect it had on me. But no one in it has the smallest amount of grace. The Big Lebowski at least had the Dude, but here the Coens took him away, even the possibility of him, and left us bereft. I’ve always considered myself a bit of a misanthrope but next to the Coens I’m a freaking Pollyanna.